They hadn’t really liked the measures they’d had to take to keep the population under control. No one did. While she didn’t entirely approve of Kevin’s contract either, a look at some of the alternatives out in the Manifold had convinced her that kids could do a great deal worse. Being one of Kevin’s Thralls – or even being an indenture-slave in Kadia – wasn’t too bad. Oh. The deep wilderness preserves had no law or law enforcement – so if you got into trouble there, you were on your own – and if someone managed to capture you there, and claimed an indenture on you after dragging you back out, it was legal. Of course, fighting back, or dying and waking up back at the malls, was legal too. Still… letting people wander into something like that without warning them was just wrong! She should be fine; she was pretty good herself and she still had that bodyguard of Thralls that Dad had assigned. Her temper started cooling rapidly when she found that entering a “lawless zone” required being of age, signing a waiver, listening to various computerized warnings (including the odds of getting into various kinds of trouble), being admitted past a series of barriers, and a long trip into the wilderness. It took her Thrall-companions several days to find a group of young women who’d been captured to rescue… Not that wilderness camping wasn’t fun, but it was looking like you really had to WORK to get into trouble this way. That turned out to be a group of… six young women, who’d been captured by a trio of boys who were heavily armed with stun weaponry. Evidently they’d been out “hunting” for months, and had finally found a group to capture. She took the one on guard down fast and silent, and put the other two out while they were asleep. Interrogating the young women however… They’d come out here just because it would be EXCITING? Because there was a small element of danger and they wanted to feel like they were really taking some risks? They hadn’t brought any major weapons, or hired any guards or guides, because they wanted the “authentic wilderness experience”? She had better things to do than to run around rescuing people from self-inflicted nonsense! Something snapped – and her newly-acquired Kadian ID surged a bit to the front. Idiots were warned, and if they persisted in their folly, and got into trouble, it was their own blasted fault! An indenture-term might teach them to think! She loaded up the whole collection, had her Thrall-companions call for some transport and indentured the lot of them! Not that she really had anything in mind to do with them – and she still couldn’t bring herself to just put them up for auction. 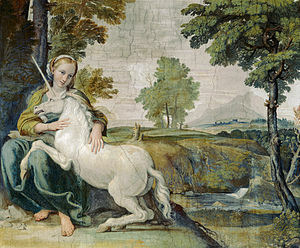 While she was trying to decide THAT, it was pretty irritating to find that blasted boorish unicorn stallion was still hanging around in the local woods – and the thing had apparently caught some gullible kids. Apparently even Core kids could have some awfully unrealistic notions about unicorns. That was profoundly stupid too, but not quite as dumb as her current collection of slaves! Still, if they hadn’t been so blind as to NOT ASK ANY QUESTIONS AT ALL they wouldn’t be part of a herd of unicorns now! Wait a minute… The Unicorn had tried to catch her, and had been catching other girls, so… Yep. Kadian law said that she was free to try to catch it if she wanted! All she needed was to… order the appropriate magical bridle! She wasn’t sure how her parents would feel about her deploying some indentured girls as bait – but the thing was sapient and Fey, and wasn’t likely to be fooled by illusions or decoys! It was a bit embarrassing, even with her smartclothes set to filter things like that a bit by adding clothing – but the silly girls HAD pretty much gone out in the woods to be bait, so this was no more than they’d been asking for! The blasted thing was clever, and managed to slip off with the bait three times before managed to penetrate it’s own illusions, catch it in the act, and slip the bridle into place. She hadn’t quite decided if she’s going to sell him yet. She’d be happy if he agreed to vacate Kadia! As much as she hated to admit it, he had a point! And one she REALLY should have expected! What else did the creature want girls for anyway? There’d probably be some sort of limited loophole in there somewhere – but he WAS a fey. He seemed slightly surprised though. Actually he was surprised to get out of it without having to swear to a term of service – at least twenty-one years would have been usual! He wasn’t used to dealing with people who didn’t want to enslave their opponents! Ruth had done her research; she had the binding oath on file and memorized. The standard phrasing would bind HER to leave him unmolested as long as he sticks to his word though – and made it expensive-to-nigh-impossible for him to break it anyway. She’d decided that that was good enough. While having to leave him unmolested might be a problem if he made trouble for other people, this was mostly about avenging the sleight against her. It would be embarrassing for them later on to admit that their first offspring were unicorn foals, but far worse things could happen! By the time they’d finished, the indentured “bait” had – of course – finished transforming into a pregnant female unicorn. Ruth sighed. Oh well! Taken as a concubine and impregnated by some male was probably THE most common fate for an indentured girl in Kadia! She’d be all right – and the unicorn magics would probably stick permanently. There were far worse packages. Hmph. Was this urge to catch girls from Core part of Kevin’s darkness? She’d seen enough to have to admit that chasing girls otherwise was pretty normal for males…. That left her with three male and two female indenture-slaves herself. What to do with them?